Here's one. Are there any others? 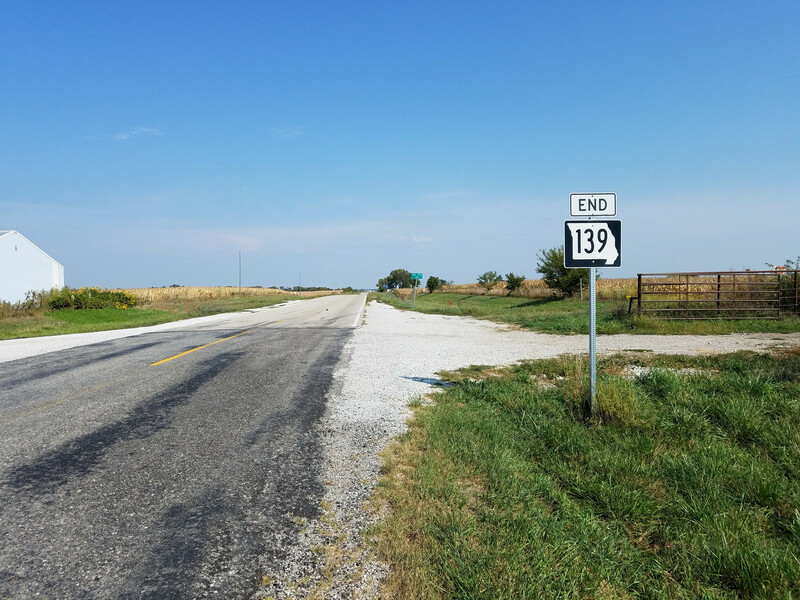 MO-139 ends at the Missouri/Iowa state line. North of the line it is an Iowa county road. There are BEGIN/END signs for MN-36/WI-64 just east of the new St. Croix River bridge. I don't have my own pictures of these yet, so here's GSV. 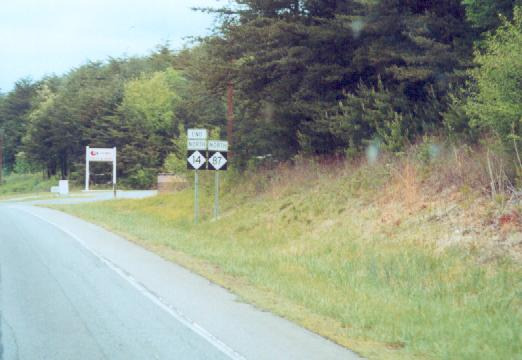 GA 520 has an END sign where it crosses the Chattahoochee into Alabama. Michigan's M-156 has one at the Ohio border just south of Morenci. 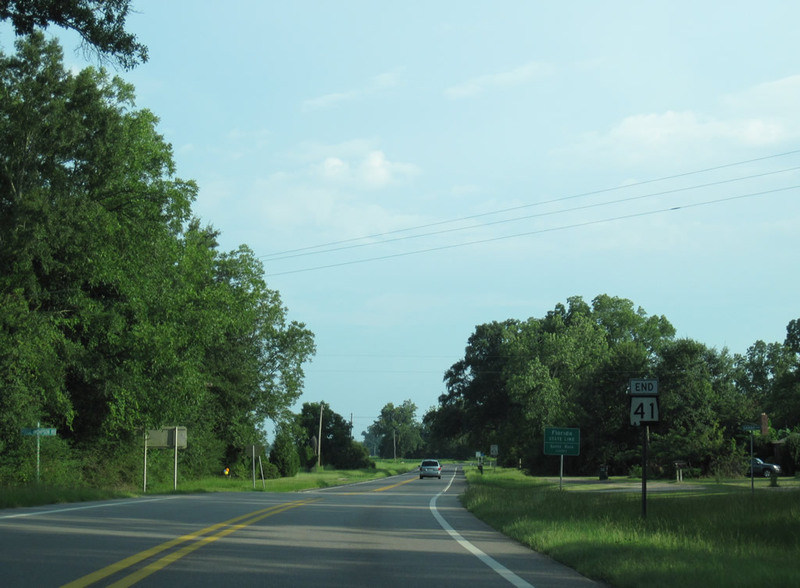 The road continues as Ohio Route 108. In Burlington IA, eastbound on US 34/IA 163, there is an End IA 163 on the bridge at the Illinois state line. I saw this just a few days ago. I wonder what the eastern end of SR 299 in California at the Nevada border looks like? Looks like it will be up to Mad Max to find out...LOL! Is there a joke I’m missing here? This assembly used to be posted at Ft. 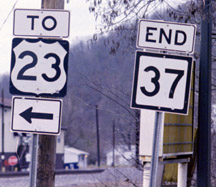 Gay, WV, where WV 37 crosses the Big Sandy River into Kentucky. Here's an NJ County Route END sign at Burlington County line. The route continues into Camden County with the same number. There's no GSV past there (but an old NV-8A shield) in that high desert terrain. Our own Max Rockatansky has been keeping himself busy documenting pretty much any and all CA state highways with photo logs; he'll likely be covering the east end of CA 299 at some point -- at which time we'll know whether an "END" shield assembly exists. MN 36/WIS 64 have dual end/begin on the new St. Croix crossing. WIS 64 formerly had one at the old lift bridge. SD 10 has an End where it becomes MN 28. Yeah, I looked that up before making my comment, and indeed that’s why I made the comment (that is, since there was Street View I didn’t get why he was wondering what the end looked like). But sparker clarified it. Question: Do you think there should be an END sign at a state line that bisects an MSR? Random example: KS-52 continues into Missouri as MO-52. 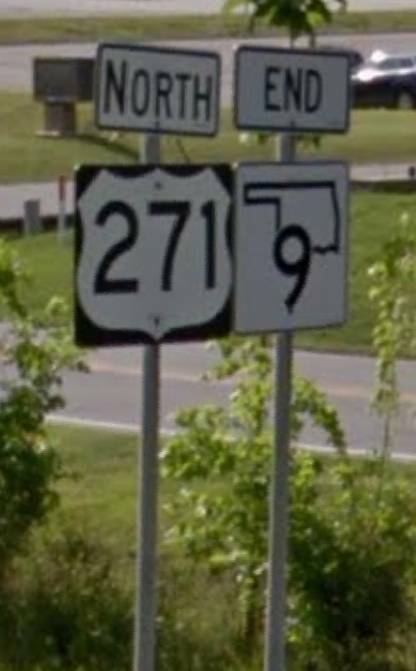 Should there be a sign saying END KS-52, or would that simply confuse drivers more than it would help them? There should not be an end sign. The route doesn't end; it just continues into a different state. Is your answer the same or different if the number changes at the state line? i'd say the best option is END X followed by BEGIN Y if the numbers differ. One example in Michigan I can think of that continues as the same route number into the next state is M-49 and OH-49, a few miles east of the tri-point between Indiana, Ohio and Michigan. Michigan has a M-49 sign right away, Ohio's first OH-49 sign is about a half mile south of the state line and neither of them have an end sign. M-99/OH-15 is the next one over and there is no end sign for either highway there either. Michigan simply has an M-99 sign and Ohio has a OH-15 sign again about a half mile from the state line. At M-52 and OH-109 Ohio does a better job than Michigan at this one since Michigan doesn't have the Welcome to Michigan sign right at the state line and Ohio does. M-52's first sign is right next to the Welcome to Michigan sign. You can see the Michigan sign from the state line but it should be closer to the state line. 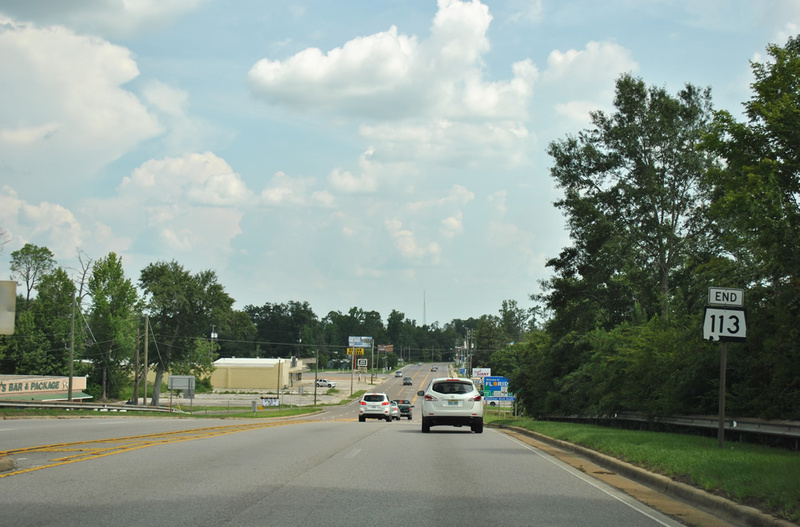 The Michigan sign is a little north of the state line on US-24 too. I think this is my preference. Just sign the new highway's number, no need to say the old one is ending. The exception is if the road continues not as a state highway. Then I think it's entirely appropriate to sign the state highway's endpoint.